I woke up to a gloomy Thursday morning here in the Philippines last October 6, 2011. Aside from the rainy weather at that time, the first thing I read on Twitter when I opened the computer was "BREAKING: Steve Jobs has died." Following that were a great number of tweets confirming the news and different reactions. My reaction was not at all that different from everyone. I was literally shocked and affected. Yes, I was affected. In fact, the sadness I felt was far from what I expected it to be. For me, it was sadder than the death of Michael Jackson or even our ex-president Cory Aquino who were also great people of their time. The death of Steve Jobs just hit me on a personal level. It may sound a bit exaggerated but it's true. 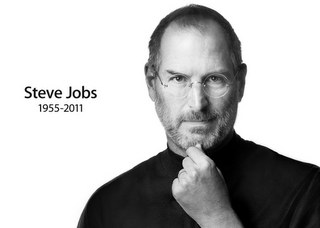 He was a visionary, a great leader, an innovator, a genius and one of the few people I sincerely look up to. I got my first iPod last 2006. It was this first generation iPod Nano. I got so amazed by such brilliant product that it actually made me care about technology more. In a way, this was the start of me becoming such a techie person. Two years after that, I got the iPhone 3G as my first smartphone. I still think and can boldly say that it was one of the best 'gadget' decisions I've ever made. I fell in love with the integration of the iPhone and the iOS. I became an iPhone fan ever since. I've explored the technology and even studied it. I wanted to make the most out of the phone that I even studied how to jailbreak it and modify the OS. I currently have the iPhone 4 and after 3 years of becoming an iOS user, people even come to me for support like I'm an Apple staff. I give them free support anyway because I simply just loved what I'm doing. On a personal note too, I look up to Steve with the way he lived his life. I followed his life starting from that day I became interested with the iPhone. Aside from giving mind blowing and effective keynotes and being an optimistic perfectionist, he basically just taught every one to "follow your heart" and as cliche as this may sound, it's the only way to truly make you happy and successful. Although this was how I already lived my life even before, he actually gave more sense and meaning to it. I still live by it through his inspiration and I am really happy with where I am at right now. Thank you very much Steve. You changed the world. Your existence mattered like that of Einstein and Edison. You left a very great influence on every one including me. You will always be remembered.